banjira Harmonium Yoga 2.66 Octave 2 Drone Gig Bag. Light Finish. This harmonium is light weight and very portable. It only weighs 16.7 lbs., and the top of case can fold over to close it. The keyboard pops up for playing and can be easily placed in locked-down position for storage and travel. When closed, the height of harmonium is 11.5 inches and when open with the keyboard popped up, the height is 12.75 inches. The double fold bellows provide airflow to the 32 keys 13 black and 19 white, with a note range from 2C to 5G and produces excellent sound volume. This model is tuned to A=440 Hz +-5 cents. Pitch can vary significantly with changes in temperature, pumping pressure, and number of keys played simultaneously. There are 2 stops in the form of knobs and each control air flow to each bank of reeds, the higher bank contains notes: 3C to 5G and the lower bank contains notes: 2C to 4G. There are also 2 knobs that control the drones, one drone is 3C and one is 3G. Other features included are a fixed key board, integral bellows and dozens of sound combinations. This model is made from tropical hardwood and has a clear finish. Please Note: Finish color and decoration style may vary from photo. Harmoniums are mainly used as an accompaniment to devotional songs. As with many Indian instruments, the key for the music is selected to best suit the vocals or to set a mood. 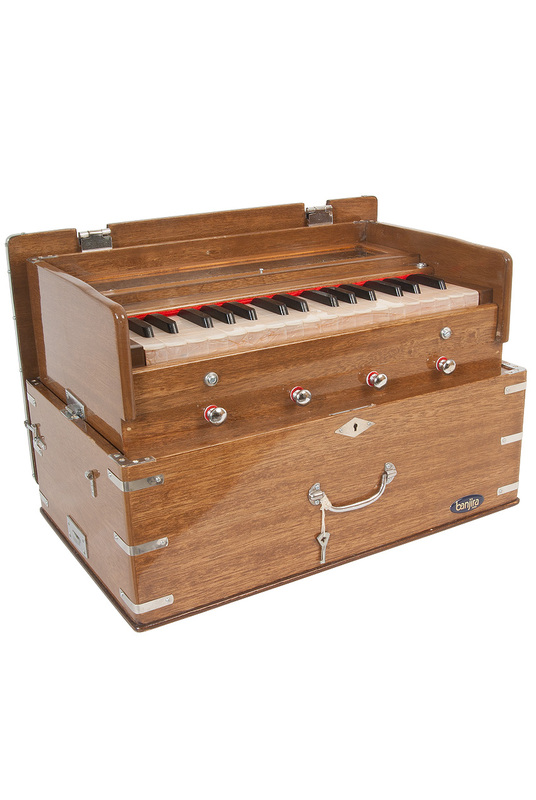 Although it was invented in France nearly 200 years ago, the harmonium has been extremely popular and strongly embraced by India after it was brought there during the British Occupation.